Those are eyes. Definitely eyes. This is what happens when an alien hears about cuteness but doesn't really know what it looks like. It's so easy for it all to go horribly wrong. 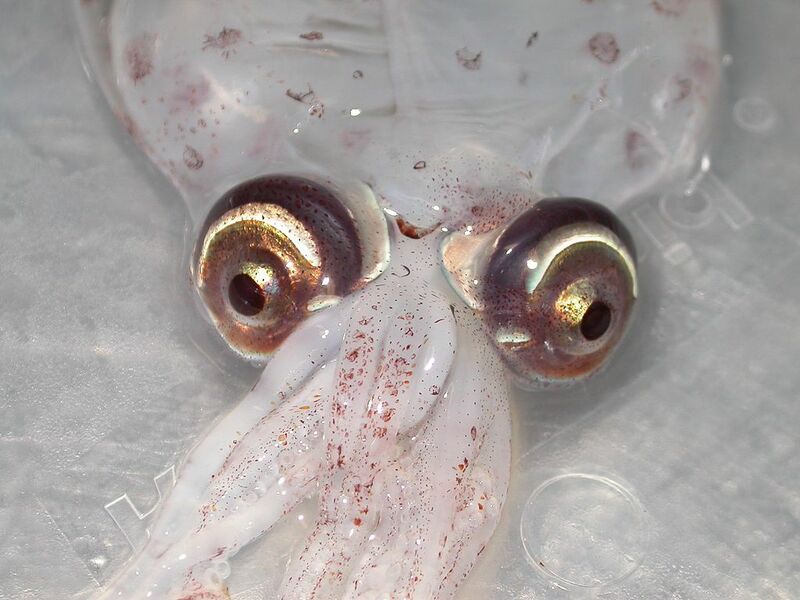 And this squid even has three light-emitting photophores in each eyeball, so you are GOING TO SEE THEM. Having said that, I'm sure glow-in-the-dark eyeballs will take the fashion world by storm some day. We're looking at the Atlantic Cranch Squid. Using our eyes. Our tiny, tiny eyes. They live in our skulls, using their tentacles to catch photons from- no, wait... I'm gonna have to do some mental exercises to get eyeballs out of my head. As it were. The Atlantic Cranch Squid lives in temperate and subpolar waters of the northern Atlantic. Females are about 40 cm (16 in) long not including tentacles, which is about twice the length of the males. That's a pretty good size, but don't think that they're easy to see. In fact, they'll probably see you first. With their huge... vision. 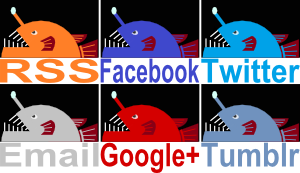 One difficulty is that they come from the deep sea. Nights are spent hunting in the twilight zone, where the hazy light allows them to spot prey. With the rising sun they descend into the darkness and relative safety of the midnight zone. And all the while they're almost completely invisible! 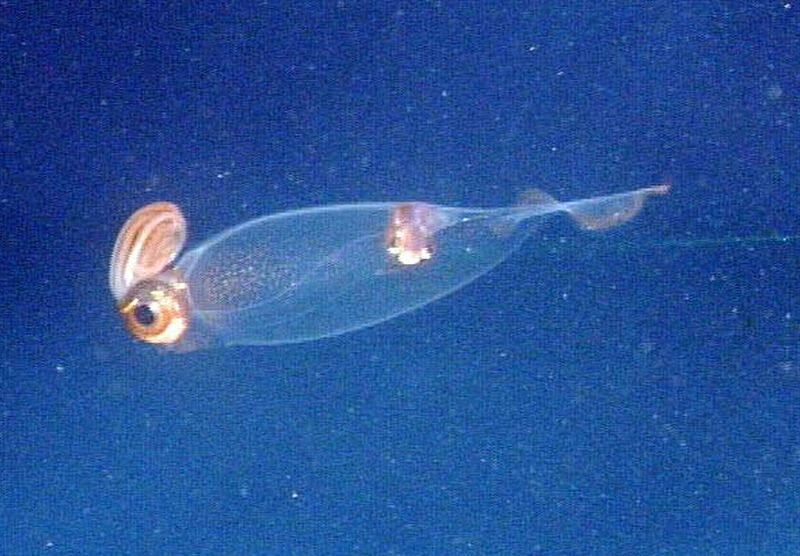 This particular Cranch Squid is just one of some 60 species in the Cranchiidae family, all of which are also known as Glass Squid because so many of them are almost totally transparent. The Atlantic Cranch Squid is a great example! They have a couple problems, though. One is the digestive gland. 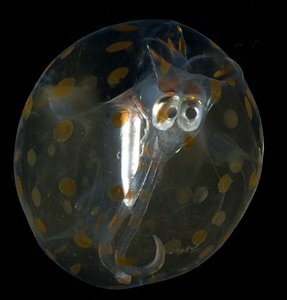 Just like with the Glass Octopus, it's just really hard to make that thing transparent. So they don't even try! They just make it really, really tiny. Most predators will be underneath them, trying to spot the shadow of something juicy against the surrounding twilight haze. This means that the important thing is to make the digestive gland extremely thin so that it casts almost no shadow at all. 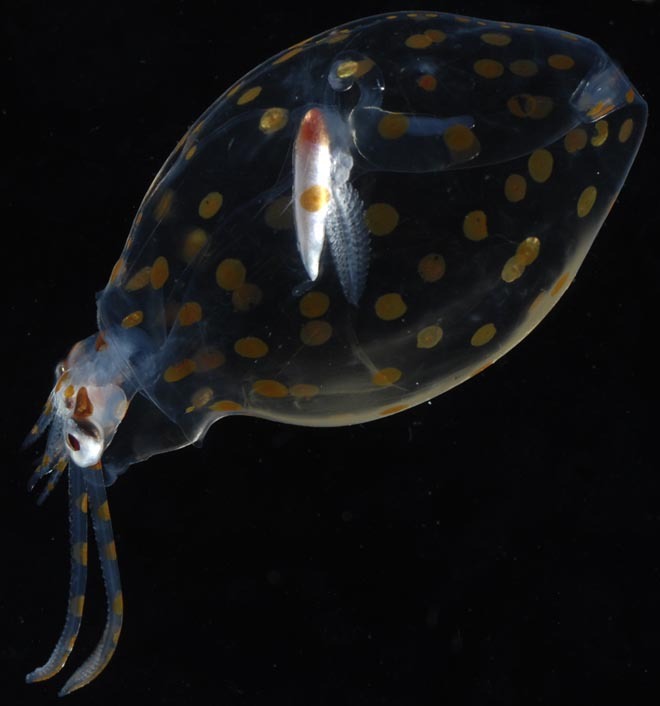 The squid even moves it around within its body to ensure the gland always points downward. It's like a little chandelier hanging from a submarine ceiling. They're so massively gigantic they cast a pretty good shadow on their own. And I guess the squid just can't afford to have small predators attacking their eyeballs. That's where the soon to be fashionable glow-in-the-dark eyeballs come in. One of the photophores goes along the top half of the eye. This lights up to match the surrounding gloom and mask any shadow it would cast. 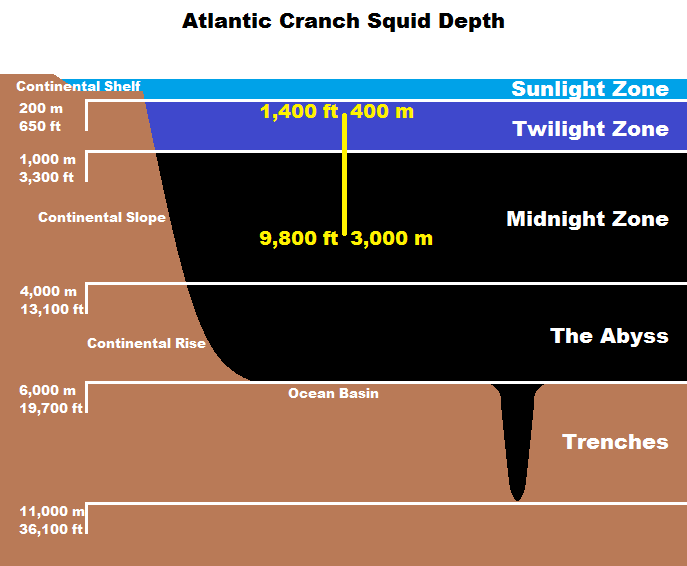 And it's along the top because the Atlantic Cranch Squid swims upside down with their tentacles raised above their giant orbs of merciless vision. For this reason many Cranch Squid are also known as Cuckatoo Squid; they look a bit like a cockatoo gone all weird. Oh yeh. Sometimes they get attacked anyway. And when that happens, strange things are afoot. 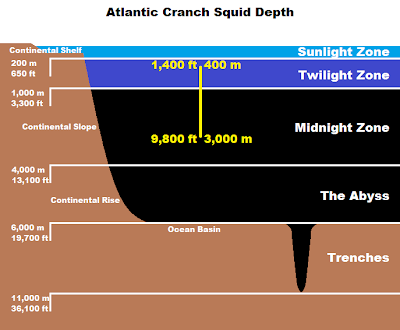 This here is a paralarval Atlantic Cranch Squid demonstrating stage 2 of their unbelievably mad defence strategy. The youngsters spend their time much closer to the water's surface, probably floating there after hatching at great depth. They look much like a miniature adult. Squirt ink and jet away. Classic! Inflate itself into a ball. This is done by sucking water, head, arms and tentacles into the mantle. Inside. It's now a smooth, transparent sphere with weird stuff inside. A marble! Squirt ink. This time within the mantle. It's now a big, black ball. You know what else is a big, black ball? A giant, transparent eyeball! You can SEE the aqueous humour! @TexWisGirl: It's always good to laugh in the face of such horrors! @Crunchy: Wow! That OwO really works!